Yes! this is my promised 100th Post with a giveaway of gorgeous goodies, BUT, I am going to make you wait until the next post because I have something really exciting to tell you about and it cannot wait! We at Precious Purl are excited to announce that Wendy Bailye, from Brisbane, Felter extraordinaire, fabulous teacher, an editor/contributor to FELT magazine, featured Artist at National Craft Fairs and all round lovely person is coming to run a Workshop at Precious Purl! 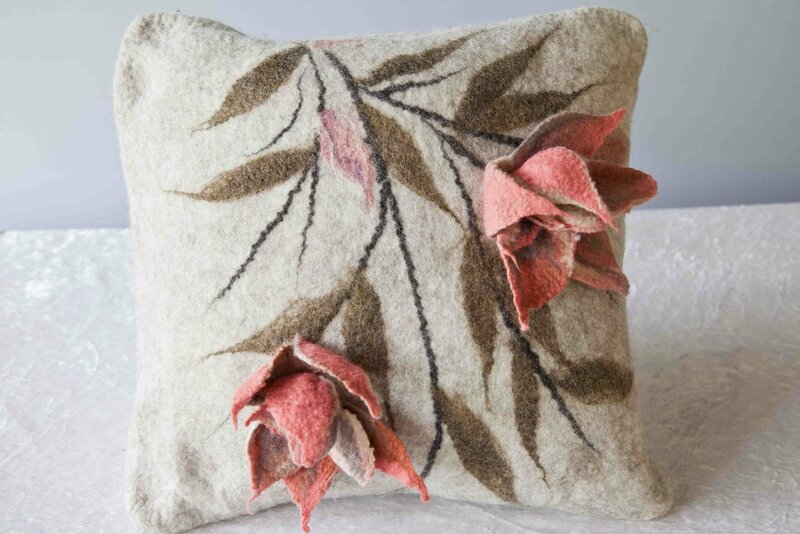 Content: Participants will make an exquisitely Textured 3D Floral Cushion Cover using wool and silk fibres and fabrics,You will learn textural techniques, moulding of flower shapes and how to use a template! Email me (see my Profile) for all details including cost, requirements and enrolment form. Get in early as this is Wendy's only teaching engagement in Melbourne other than for the Victorian Felters and places are limited! My next post will definitely have a Giveaway, I promise! Hi Lynda, I have emailed the info to you about Wendy's workshop, hope to see you there. Working on that next post!!! I love the colours on the flower! !